Staff from the Center for Integrated Neuro Rehabilitation in Caribou stand in front of a display at the Caribou Public Library showcasing artwork created by clients for Brain Injury Awareness Week. Those pictured here, from left, are Pamela Searles, Keely LeBlanc, David LeTourneau, Betty Hendrickson, and Kevin Huston. For over a decade, people in The County suffering from brain injuries have turned their experiences into art as part of the Center for Integrated Neuro Rehabilitation (CINR) program based in Caribou. Now, that art is on display at the Caribou Public Library for the entire month. Pam Searles, a clinical consultant with CINR, said this is the first time the facility has ever showcased their clients art via a public display. Keely LeBlanc, a CINR brain injury support specialist, said she often uses art as a medium through which her clients can both express themselves and re-develop skills that may have been lost due to a neurological condition. Caribou Public Library Director Hope Shafer said she and the library staff were “thrilled” and “excited” to bring awareness to the public about both the center and people in the area dealing with brain injuries. 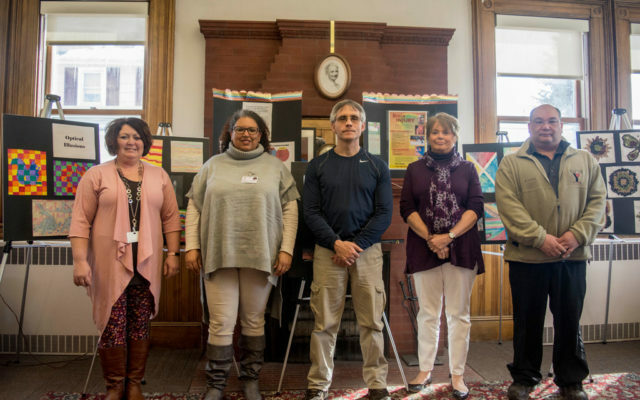 Searles said CINR, which is part of the Aroostook Mental Health Center (AMHC), primarily focuses on helping those with trauma or an acquired brain injury to get back into and functioning in society. That goal is accomplished through many outlets, such as art, she said. LeBlanc said she hopes the exhibit will help members of the community learn more about the experiences of people with brain injuries. Huston said this is one of the primary misconceptions about brain injuries, adding that it “is not always evident,” and that people with brain injuries sometimes exhibit different characteristics. The art pieces themselves were drawn as part of the program’s efforts to improve motor function, the following of directions, and problem solving. For one project, clients had to draw straight lines and follow a pattern, while another involved placing beans over a tracing of an image. LeBlanc said that some aspects that go beyond the directions, such as which colors to choose, can be overwhelming to certain patients and may cause them to stop. Other clients, however, began with specific patterns in mind and ended up becoming so absorbed in the project that the end result did not resemble their original intention. CINF is CARF (Commission on Accreditation of Rehabilitation Facilities) accredited, and while it specializes in brain injury rehabilitation, staffers also are able to help clients get in touch with other mental health professionals working under AMHC. Jamie Owens, director of marketing and development at AMHC, said the organization has been providing services to people in Aroostook, Washington, and Hancock counties since 1970. AMHC now serves about 6,000 clients annually. Searles said that if a client comes in with issues related to mental health counseling or substance abuse, CINR staff will make referrals to the appropriate organization. While the library exhibit had only been up a few days, Shafer said she’s already heard a great deal of positive feedback from patrons.